Open to the public 10:30 a.m. - 5:00 p.m Monday - Friday. Appointments are required for all tastings and tours on Saturday + Sunday. Tours by Appointment. Parties larger than six by appointment. Stunning Visitor Center architecture and beautifully landscaped grounds highlight the experience at Darioush. Guests are welcome to sample the current release wines fireside, explore the 250 seat amphitheater or reserve a space on one of many leading-edge private tasting and tour programs. Equally important to Darioush's wine quality, is its dedication to unparalleled service by creating unique, memorable experiences for each guest. The tasting room was designed to create a welcoming, rich and intriguing environment for visitors; the aesthetics balance the modern and ancient with historical references to Persia’s ancient capital city and winemaking tradition. Enjoy your wine flight at the tasting bar or fireside and peruse treasures selected from artisan manufacturers from all over the world. The Darioush is open for tasting from 10:30 A.M. to 5:00 P.M. daily, with appointments required on Saturdays. Reservations are always required for parties larger than 6 guests. Let the hospitality staff make the most of your visit by experiencing one of the tasting opportunities available by appointment, such as 'By Invitation Only' and 'Fine Wines, Artisan Cheeses'. Simply book in advance with the Darioush Concierge at 707.257.2345 ext. 130 or visit Darioush.com. To join the wine club, visit www.darioush.com or call 707-257-2345. The First Offering Reservation guarantees priority access to our most popular and exclusive wine releases each year. 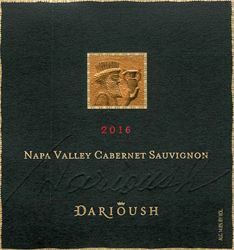 With your custom reservation, Darioush will set aside and ship your selection prior to the public release each vintage. Darioush is certified under the Napa Green Winery Program by the Napa County Department of Environmental Management (DEM) and the Association of Bay Area Government’s (ABAG) Green Business Program and completed all the regulatory components needed for environmental sustainability. These components included developing water and energy conservation methods, preventing pollution, and reducing solid waste. In addition to developing sustainable winery practices, this program is set to become the standard for the state of California. Darioush is certified under the Napa Green Certified Land Program. Darioush has created and implemented a customized farm plan with measured results that addressed all aspects of its property, vineyard land as well as non-farmed land, including practicing soil conservation, water conservation, stable drainage, riparian corridor enhancement, fisheries and wildlife habitat enhancement and long-term improvement and sustainability.